Alistair Brown has been singing the old songs, and new songs written by people who like the old songs, since he was fifteen years old. He began his career helping out in the folk clubs of his native Scotland during the folk revival of the 60s, selling tickets & opening concerts for many of the great names in folk music. For many years, he lived in Canada, where he was active in many aspects of folk song and dance, as a recording artist, radio broadcaster, reviewer, columnist, festival director, dance teacher, university lecturer, and program director at folk music and dance camps. With several visits each year, he continues to make regular appearances in North American folk clubs and festivals, performing solo, or with the Friends of Fiddler's Green, a band which celebrated its forty-fifth anniversary in 2016, without maturing in the slightest. 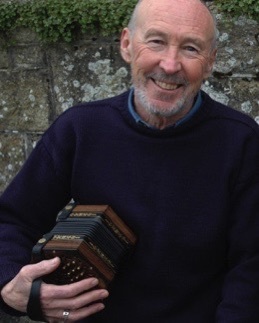 Now he lives in Cornwall, on England's Mediterranean coast, where he calls dances with the Newlyn Reelers and Tinners, and performs regularly in folk clubs, festivals, pub sessions and several ancient seasonal rituals that require the presence of accordions. When he's not performing solo, he sings and plays with Peter Wray. He is also a member of the Golowan Band, which leads the processions for the Mazey Day festivities in Penzance, and numerous other Cornish festivals. He joins Bagas Porthia several times a year to take part in St Eia Day celebrations in St Ives, and to lead the guisers around at midwinter. Audiences at concerts and festivals across North America, Australia, New Zealand and the UK have responded enthusiastically to his performances, covering the field from big ballads, comic ditties, songs of struggles (usually unsuccessful) against temptation, odes to conviviality and songs of unashamed sentimentality, to outrageously funny stories from a master of the art - all this accompanied by anglo concertinas and button accordion. He has entertained groups of elementary and secondary school pupils from 20 to 300 with songs and stories, been MC at many festivals and concerts, including hosting a symphony concert for an audience of 5000. He has been guest soloist for three different symphony orchestras, and appeared on numerous radio and television programmes. He has called dances and has played in several dance bands. He has run folk music courses at university, and has for several years, been artistic director for summer residential music programmes and of a major folk festival. He was producer/ host of A Sign of the Times, heard on radio station CIXX fm London, Canada for 25 years. For five years he also hosted Off She Goes, syndicated nationally in the USA on National Public Radio. Alistair has performed in Australia, New Zealand, the US and Canada, as well as in clubs and festivals in the UK. February/March 2020 Australia and New Zealand tour now booked. Details soon.